'Just In Time' Manufacturing Tested By Japan Crisis Japan's earthquake, tsunami and nuclear disaster have become one of the biggest tests ever for "just in time" manufacturing. That's the practice of having parts delivered just when they're needed instead of carrying large, costly inventories at assembly plants. Since the disasters, parts have been hard to come by. A worker assembles a Nissan Leaf electric vehicle at the company's Oppama plant in Yokosuka, Japan. Auto plants are reopening, but getting parts remains a challenge. Japan's earthquake, tsunami and nuclear disaster have become one of the biggest tests ever for "just in time" manufacturing. That's the practice of having parts delivered just when they're needed instead of carrying large, costly inventories at assembly plants. Since the disasters, parts have been hard to come by. 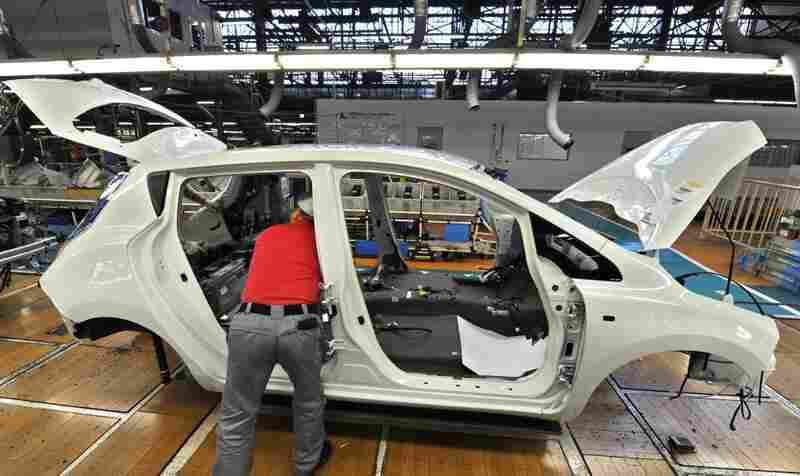 Toyota said Wednesday it is delaying the launch in Japan of two new Prius models — a wagon and a minivan — because of production problems caused by the March 11 earthquake. Toyota has suspended all 12 of its domestic assembly plants. Many other companies have suspended operations at their factories because of damage or power cuts. This is reverberating around the world because Japan makes so many components for goods assembled outside Japan. Andrew Palmer, a senior vice president for the Nissan Motor Co., was on the 27th floor of the company's building near Tokyo when the earthquake struck. That afternoon was spent making sure workers were safe. The next day was spent assessing the challenges the company faced: damaged factories, blocked roads, a lack of electrical power for trains, and a shortage of fuel for cars and trucks. That meant workers couldn't get to their jobs, and parts couldn't be delivered to factories. Some of Nissan's suppliers faced more daunting obstacles. "Some [were] badly damaged in the earthquake, much closer to the epicenter," Palmer says. "Some of our suppliers are in the exclusion zone around the nuclear plant, so we're not able to get people in, obviously." Nissan's supply chain, that complex web of parts producers and shippers, had ruptured. The good news, says Palmer, is that damage to Nissan's factories was limited and 90 percent of its workers can now get to their jobs. He expects all but one of the company's plants will be up and running by the end of this week. But getting the right parts to the right places remains a huge challenge. "A crisis like this reminds one how complex putting together an automobile is," Palmer says. "It's an incredible logistics exercise and obviously you're pulling together thousands of parts into a single car." Nissan's competitors, like Toyota and Honda, and electronics producers in the region, including Sony, face the same challenge. It's also one of the biggest tests ever for "just in time" manufacturing — the practice of having parts delivered just when they're needed, instead of carrying large, costly inventories at assembly plants. Right now manufacturers are scrambling to get the components they need. Palmer says for Nissan that means, first, helping its suppliers in the region get up and running. Second, the company is scouring its overseas facilities for the parts. "Of course, there is a third case, which we haven't had to resort to yet, which is temporary resourcing," he says. And there's another strategy: building the car you can with the parts you have on hand. But that means some customers might not be able to get the trim level or feature that they want. It's a bit like "taking a car off the lot rather than building it to order, which is still a large part of our production anyway," Palmer says. Will Automakers Move Out Of Japan? The risk for Japanese carmakers is that consumers will find an American or European manufacturer who can give them the features they want. And that may mean companies in Japan will have to take drastic action to compete. "In the short run it may accelerate many companies' move from Japan" to other countries, says Naoyuki Yoshino, director of the government of Japan's Financial Resource Center and a professor at Keio University. He says physical damage to supply chains may not be the only catalyst for moving. The strong yen is also making it hard for Japanese companies to compete. "And even the small and medium size companies [want] to move, so that is a very serious problem for the Japanese economy," Yoshino says. The most likely areas of relocation? China and Southeast Asia. Palmer says Nissan isn't planning a move. But he says there are lessons it will learn from this disaster. Foremost, a reminder of the importance of having common parts for cars built in different regions. "The car that's made, let's say, in the U.S., has parts which are interchangeable with cars made in Japan," Palmer says. "I think this crisis has reinforced that need." But Palmer says Nissan will not abandon the just-in-time model of manufacturing pioneered in Japan. He says with profit margins on vehicles paper-thin, carmakers can't afford the luxury of big parts inventories.